With a choice between two twin-turbocharged engines under its slender hood, the Mercedes-Benz SL-class of hard top convertibles has the go to match the show. The entry-level SL450 outputs 362hp from its bi-turbo 3.0-liter V6, while the SL550 generates 449hp from a 4.7-liter bi-turbo V8. A 9-speed automatic transmission and rear wheel drive are the only drivetrain options available on both models. A Premium Package, standard on the SL550, but optional on the SL450, adds Airscarf, painted brake calipers with perforated rear discs, ventilated massage seats, and automated parking. Available safety features include blind spot assist and lane keeping assist. With a name steeped in history stretching all the way back to the 300 SL Gullwing, the Mercedes-Benz SL-class of vehicles has a heritage greater than many manufacturers do. Now in its sixth generation, the SL may not attract the same sort of attention as the 300 SL once did, but the convertible-only grand tourer still punches above its weight, offering a compelling alternative to more exotic nameplates like the Aston Martin DB11 and Ferrari Portofino. One body style is offered with 4 engine variants, all turbocharged, including two AMG models to be discussed in their own review. The two-seat, hard-top roadster is larger than its sportier SLC sibling, and with a greater focus on comfort rather than performance. Taller, and broader, drivers will find an abundance of shoulder-, leg-, and head room, even with the roof closed. 12-way heated power adjustable seats are standard with 4-way lumbar support, making it easy to find a comfortable driving position. There’s also dual-zone climate control and tri-color ambient lighting for added ambience. Material quality is exceptional, as is the fit and finish, and the optional Magic Sky glass roof opens up a new world of closed-top driving when the weather is unsuitable for top down driving. When conditions suit, but the air is chilly, the available Air Scarf keeps things toasty. Despite the folding hard-top roof, there’s still ample cargo volume – 13.5 cubic feet with the top up, and 85. Cu ft with it stowed away. 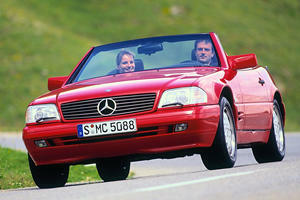 The SL-class is far from a featherweight roadster, but its weight aids in giving a feeling of solidity on the road. Confident handling is also aided by the lengthy wheelbase, which gives the SL predictable handling, even if it isn’t the most razor sharp. Optional Active Body Control adds a new layer of composure to the ride quality, evaluating the road surface ahead and tightening and slackening the suspension at each corner accordingly to iron out rutted roads. Included in ABC is the curve tilting function, that leans into corners like a motorcycle rather than rolling outward. It’s an almost unnerving feeling how flat the SL corners, and as a driver’s tool it robs you of communication – body lean often serves to communicate levels of grip – but it lends tremendously to the SL’s grand touring nature. If you want anything more driver focused, the AMG GT C is your fix. 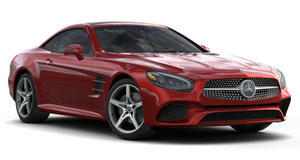 AMG models aside there are two standard SL variants, an SL450 and SL550. The SL450 receives a twin-turbo 3.0-liter V6 under the lengthy hood, with outputs of 362 horsepower and 369 lb-ft of torque, and a 0-60mph time of 4.9 seconds. The SL550 gets a 4.7-liter bi-turbo V8 boasting 449hp and 516 lb-ft, and shaves 0.6 seconds off the SL450’s 0-60mph time. All SL models are rear-wheel driven and feature the 9G-TRONIC 9-speed automatic gearbox. Both engine derivatives offer enough firepower, though the V6’s lower weight aids handling for the keener driver. The SL-class is luxury grand touring done right. Standard from the SL450 is full leather upholstery, power adjustable seats, auto high beams with LED headlights, adaptive suspension, cruise control, front and rear parking sensors, Harman Kardon audio, and full Android Auto and Apple CarPlay functionality. The SL550 adds AMG branded 19-inch alloys, a power trunk lid, rearview camera, automated parking, and ventilated seats with massage function and airscarf neck-level heater as standard. Available safety technology includes attention assist, active brake assist, blind spot assist, and lane keeping assist. The SL-class hasn’t been crash tested by local authorities. 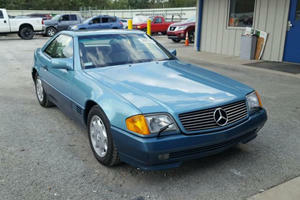 More than 6 decades later, the Mercedes-Benz SL-class is still a luxury grand tourer that turns heads wherever it goes. But style without substance is nothing; the SL-class backs up its good looks with extensive kit, charming drivetrains, and enjoyable driving dynamics. The SL450 may be the entry-level model, but it’s also the sharpest and possibly most worthwhile. 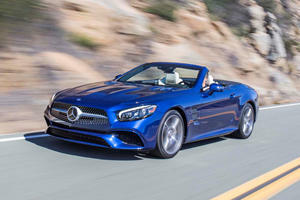 AMG is working to make the Mercedes SL lighter, faster, and more engaging to drive. Mercedes lifted the veil off its iconic roadster 30 years ago.